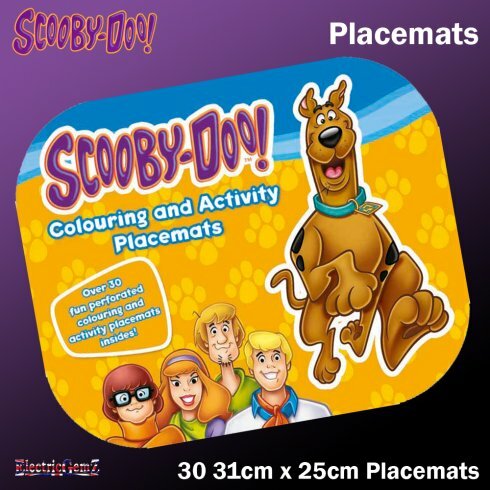 Here's a great Scooby-Doo colouring activity to use whenever or wherever you need it!Suitable for any age with supervision, these colourful mealtime placemats are great to use both at home or on the move - a calming and familiar addition to any table.Measuring 31cm x 25cm, the pad comes with 30 fun, easy-to-remove, perforated pages, so you can display your child's masterpieces when they're done. Here's a great Scooby-Doo colouring activity to use whenever or wherever you need it! Suitable for any age with supervision, these colourful mealtime placemats are great to use both at home or on the move - a calming and familiar addition to any table. Measuring 31cm x 25cm, the pad comes with 30 fun, easy-to-remove, perforated pages, so you can display your child's masterpieces when they're done. There are lots more Placemats available from our Online Shop. Search for Placemats in the box above.